It is a beautiful winter afternoon. The sun is shining and reflecting brightly off the snow on the ground. The snow is melting and I found outside my front door, a pansy peeking out a little prematurely. I would like to hope for spring but I know better! I am sure winter hasn’t given up yet. I love all the seasons and I love the outdoors! I can hardly wait for BBQ-ing and camping but for now, we still have a lot of yummy soups and breads and pot roasts and potatoes to make, that go with snowy nights and a fire in the fireplace. 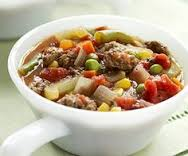 As I am writing I am smelling the wonderful aroma of Steak Soup in my crock-pot, AKA the “Kitchen Queen”. The crock-pot is one of the best ways to save time and effort in the kitchen. It’s like having a personal chef at home cooking your dinner while you are at work or out running errands. Tonight I have plans with a girlfriend after work. I put Steak Soup in the crock-pot so that my family will have dinner ready for them when they get home and they won’t have to wait for me or make anything. I love to bless my family with wonderful meals! I want to share my recipe for Steak Soup with you! Happy “Crock-potting”! Crumble ground beef in bottom of crock pot. Put onions on top of beef, then package of veggies and bouillon. Pour tomatoes over top. Cook on low for 6-8 hours. Cook’n is a next generation recipe app that makes it fun and easy to share favorite recipes. I am super excited to start this blog! It is something I have wanted to do for a long time. It is my passion to share with you ways to make your home as self-cleaning as possible so that you can spend time doing the important things! Playing with your kids and camping and going to dinner or entertaining friends, those are the things that will create memories. Those are the important things. Doing them in or coming home to a home that loves you back is even better! I want to share tips, tricks, recipes, and stories along the way with you. I hope you enjoy them as much as I do and hope it helps you to do more of what makes you happy! This picture of my family, this is what makes me happy!